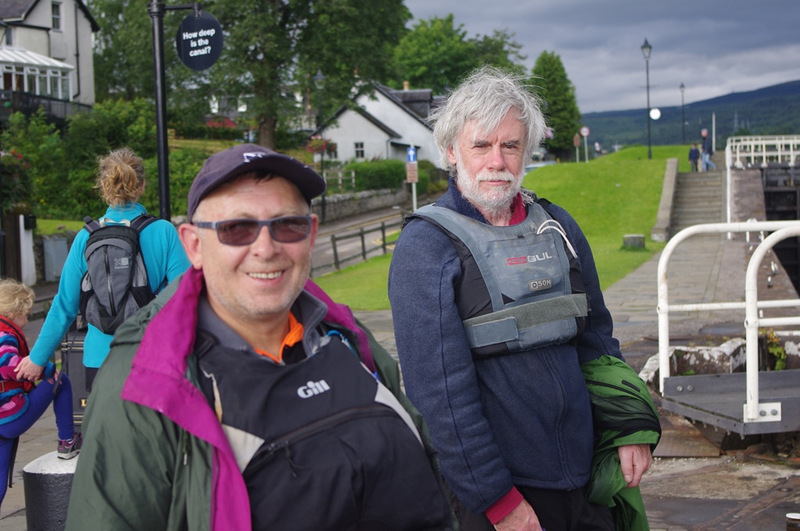 After a 1st night’s camp on the banks of Loch Linnhe at Corpach the 3 Wayfarers were de-trailered, set up and sailed along to the canal entrance to begin negotiating a series of locks and swing bridges, concluding with the 8 locks of the impressive Neptune’s Staircase. 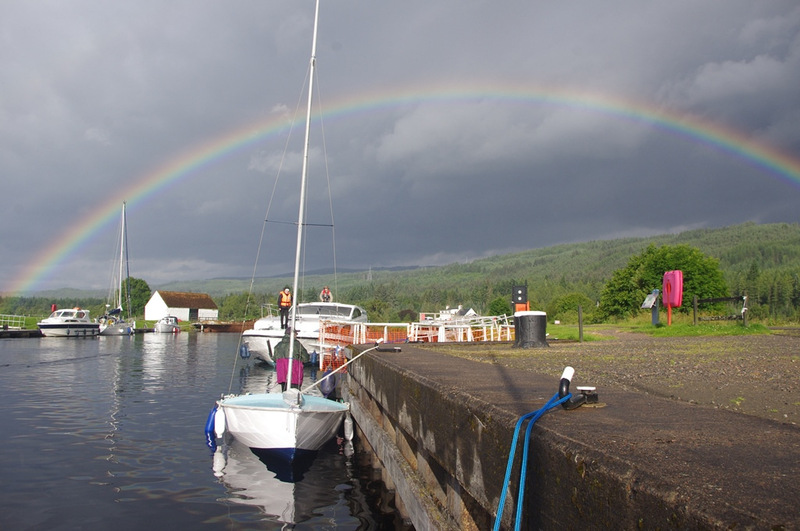 By this time the rain had started and didn’t let up for the few hours it took to proceed slowly in light winds to Gairlochy lock, dropping masts to go under Moy swing bridge en route. 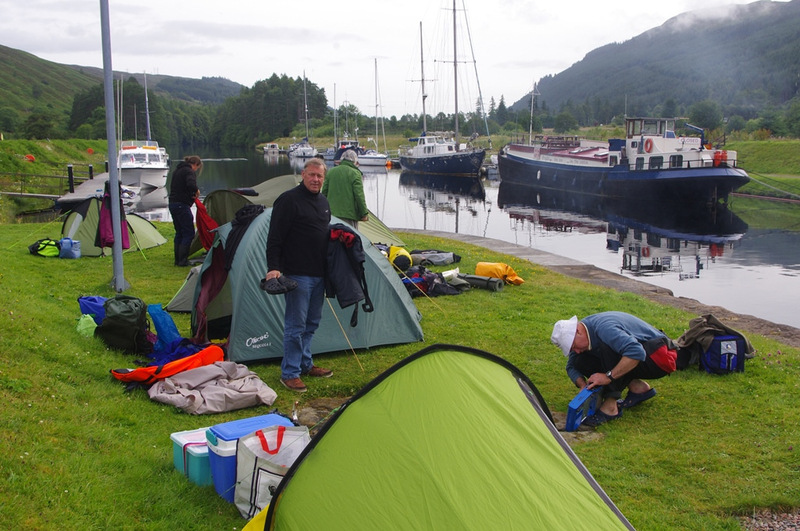 Midges at the picturesque canal-side camp didn’t heighten moods, but some BBQ food and hot showers helped, along with an escape to a full Scottish breakfast at Fort William in the morning. 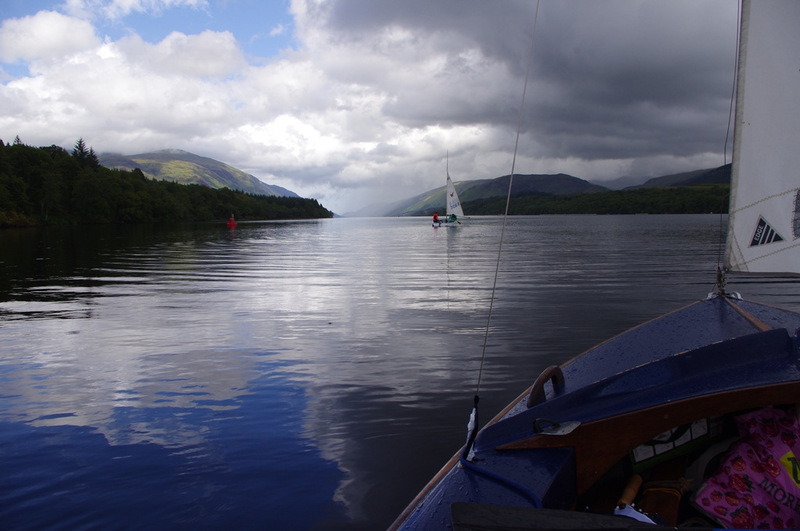 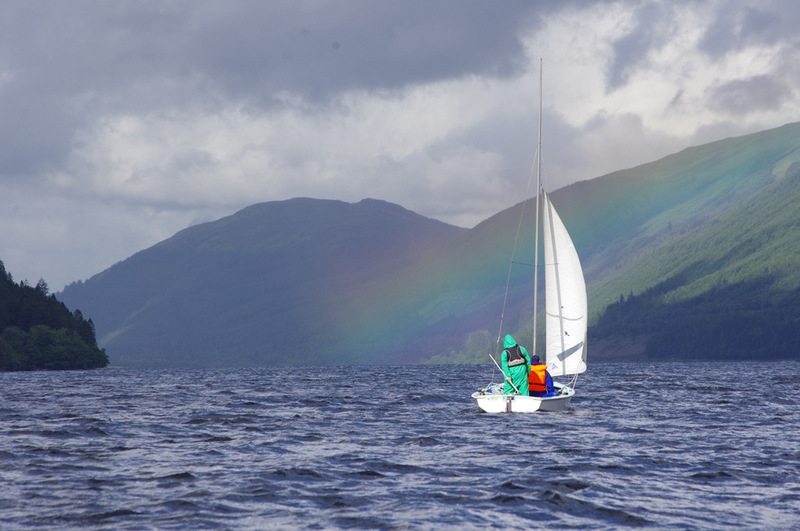 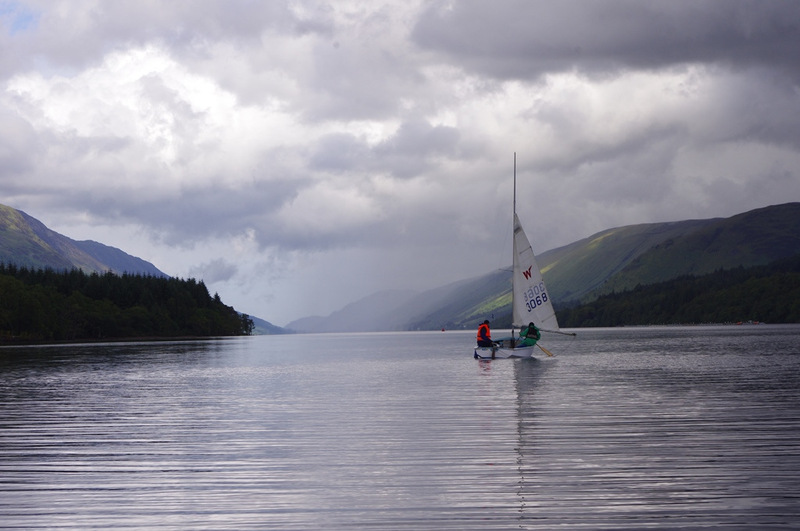 The rain eased by early afternoon to allow an enjoyable 9 mile sail up Loch Lochy in a freshening tail wind to Laggan lock, where an agreeable evening of real ale, fine whisky, bar meals and socialising with other boaters at the Eagle Barge ensued. 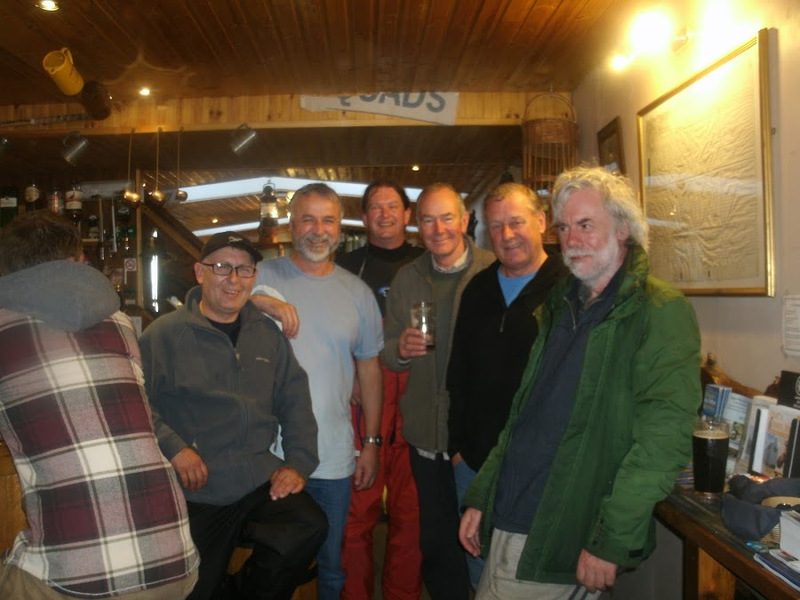 Jos tackled a sample of the “wall of fire” chilli dish with amusing results. 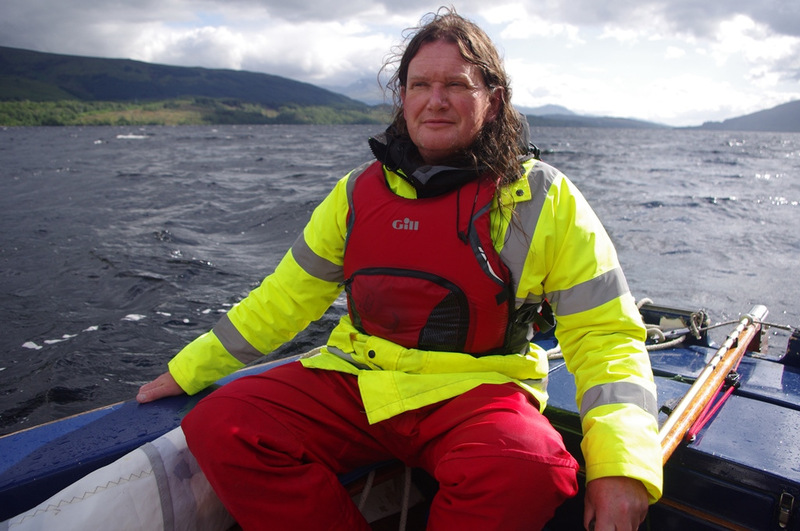 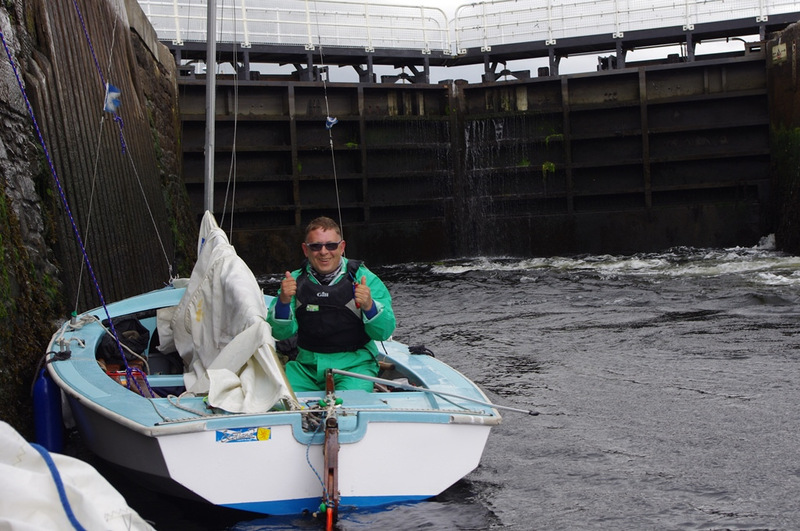 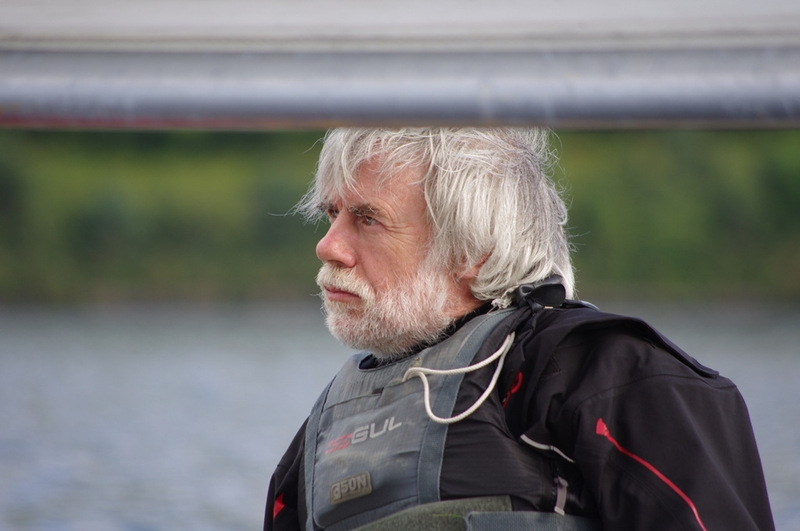 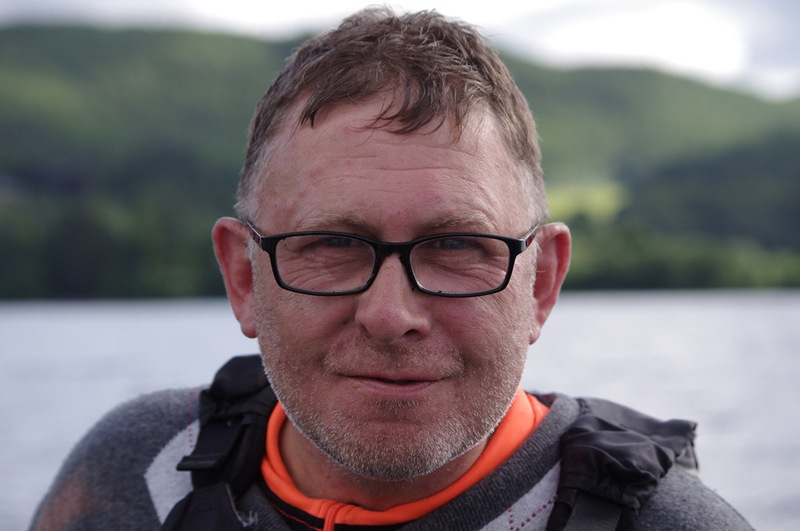 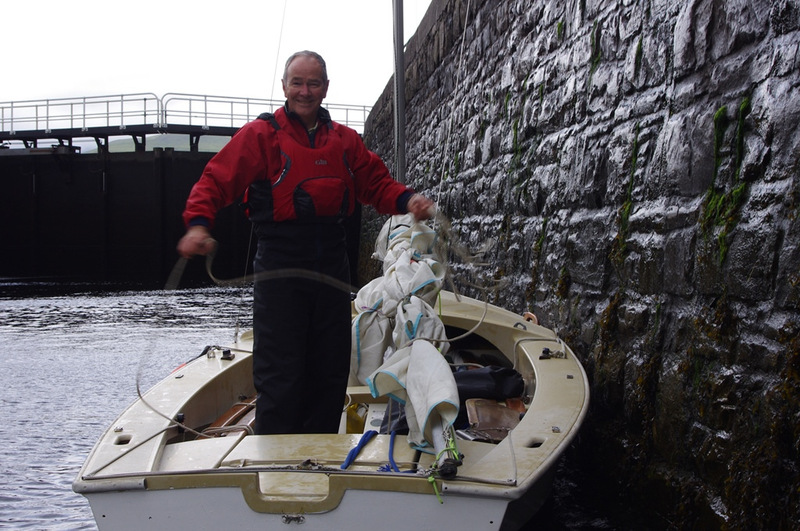 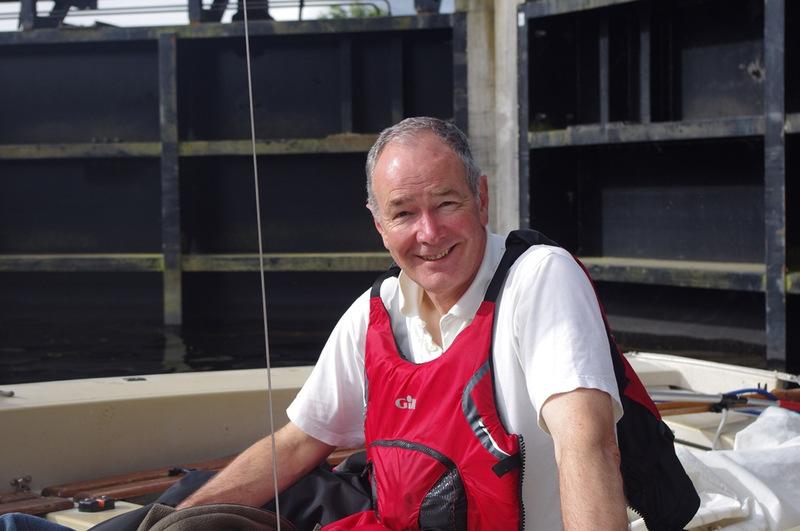 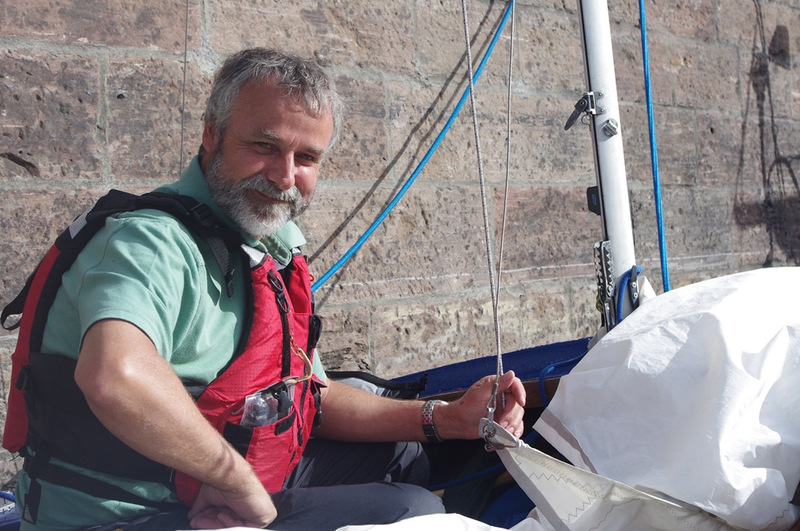 The next day the wind died, though it stopped raining, so an afternoon’s graft on the oars and paddles saw us the 10 miles through picturesque Loch Oich and canal as far as Fort Augustus, leaving the boats moored at the top of the locks. 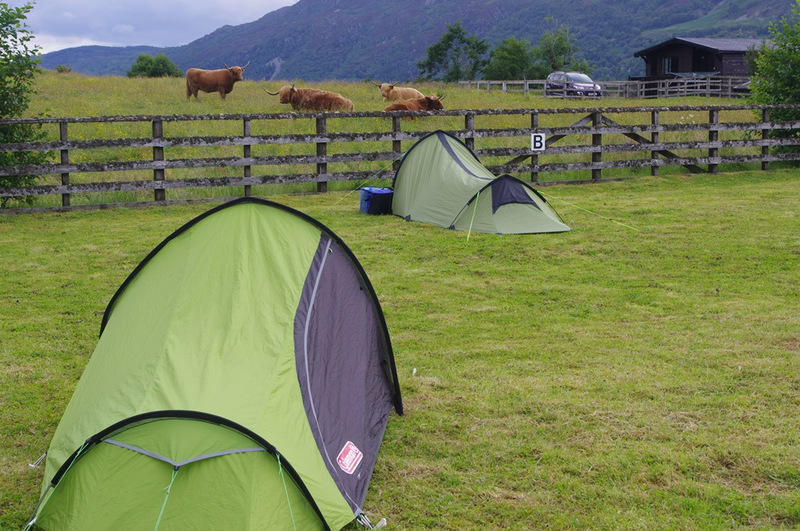 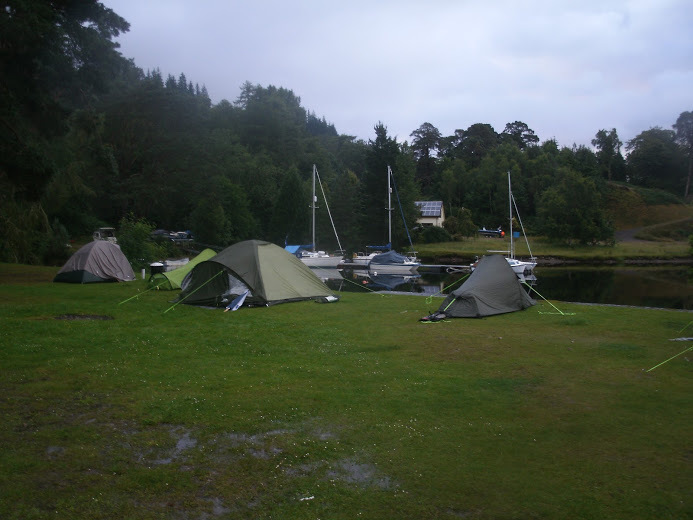 After a restful night camping at the idyllic Old Pier House, complete with highland cows and stunning views up Loch Ness, 2 of our group departed, worn down by rain, midges and paddles and with commitments elsewhere. 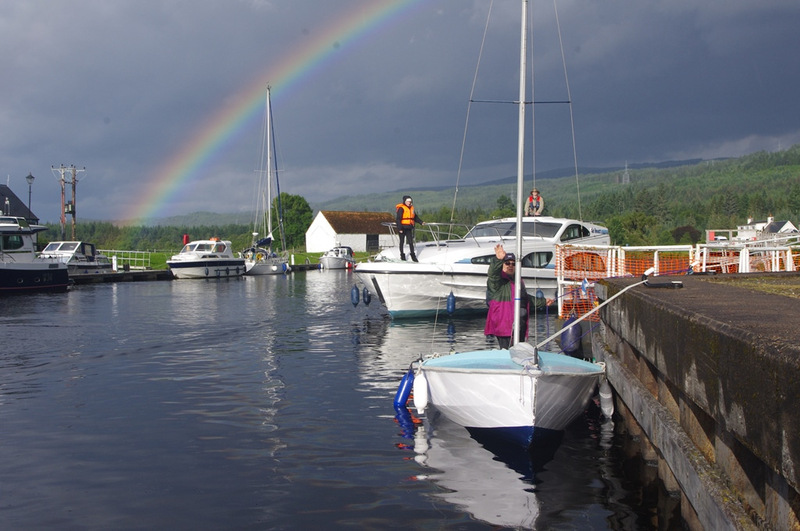 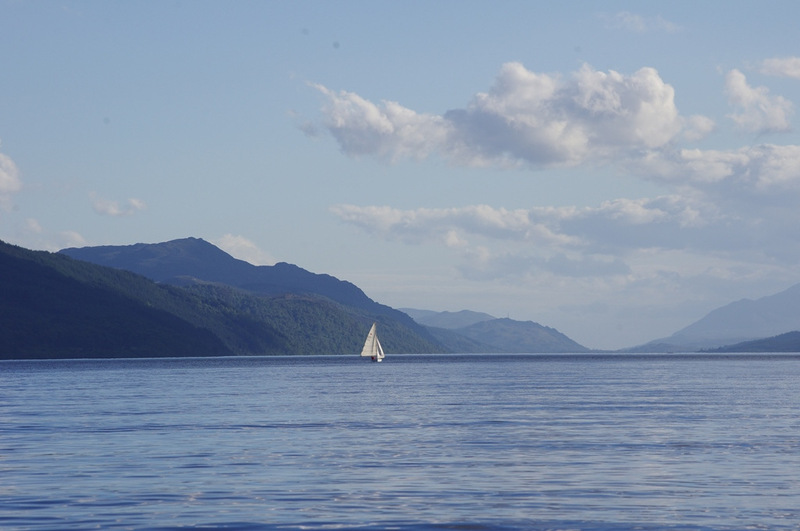 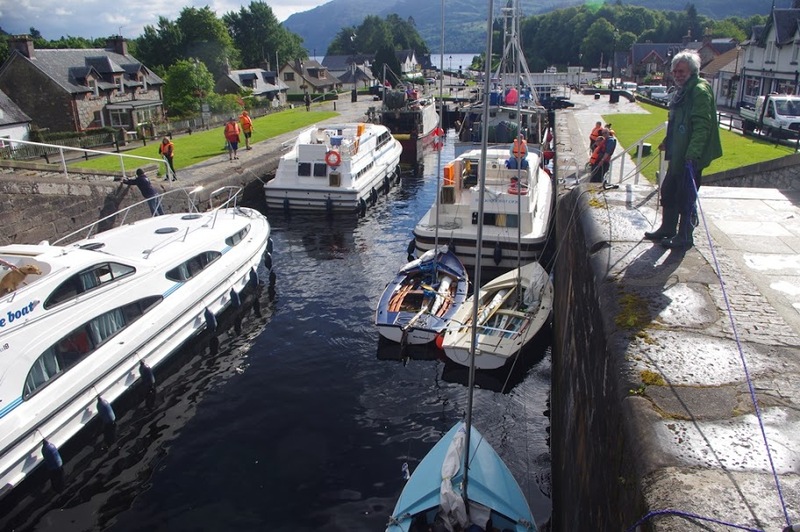 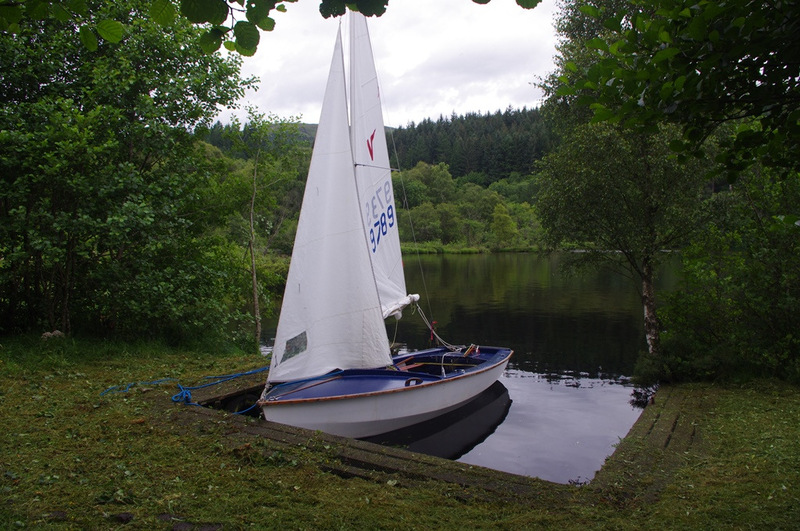 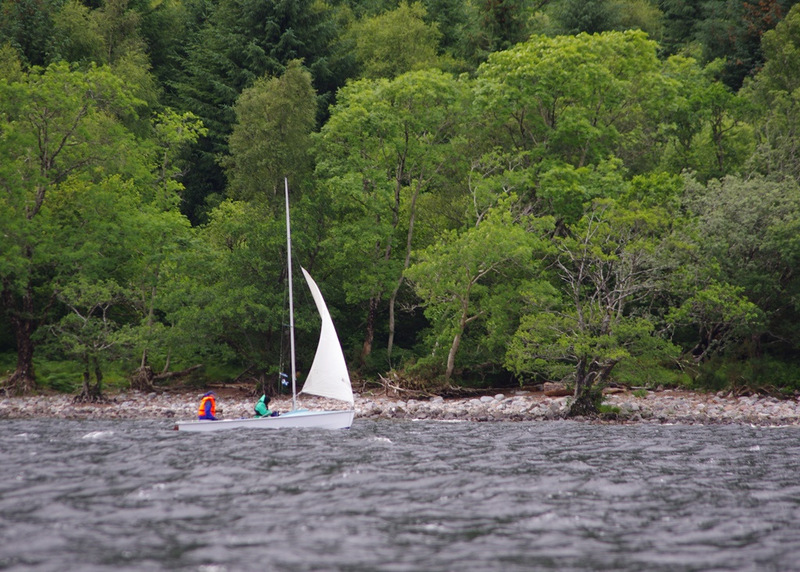 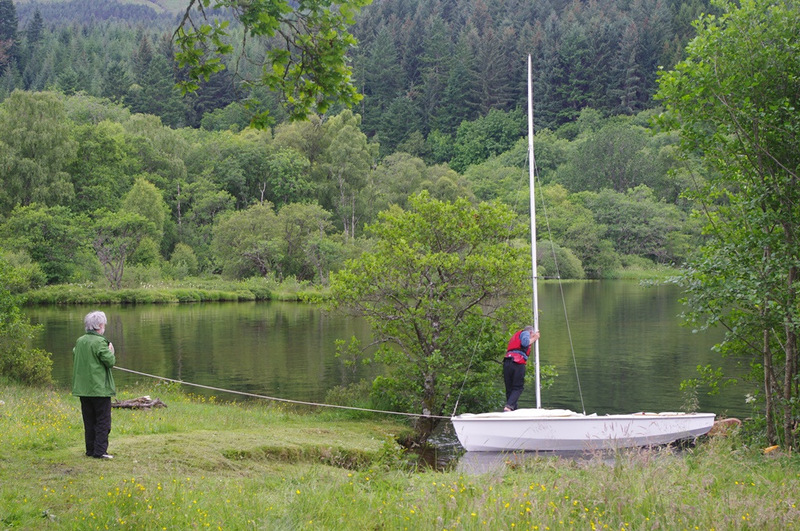 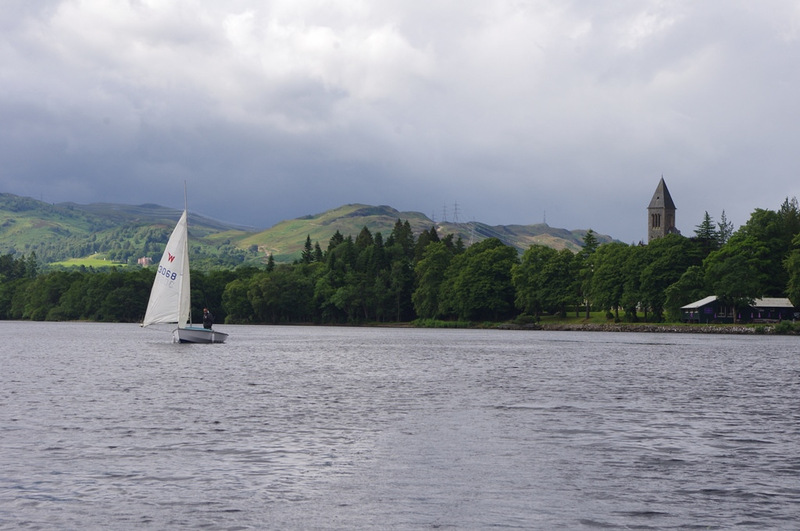 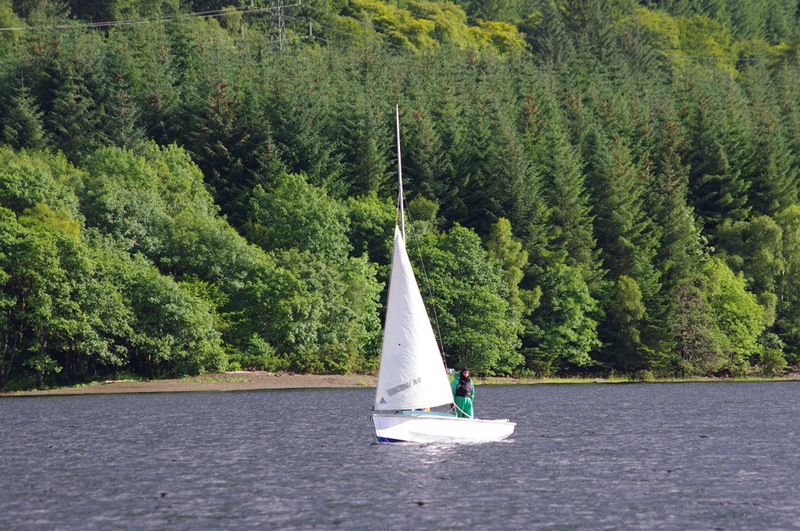 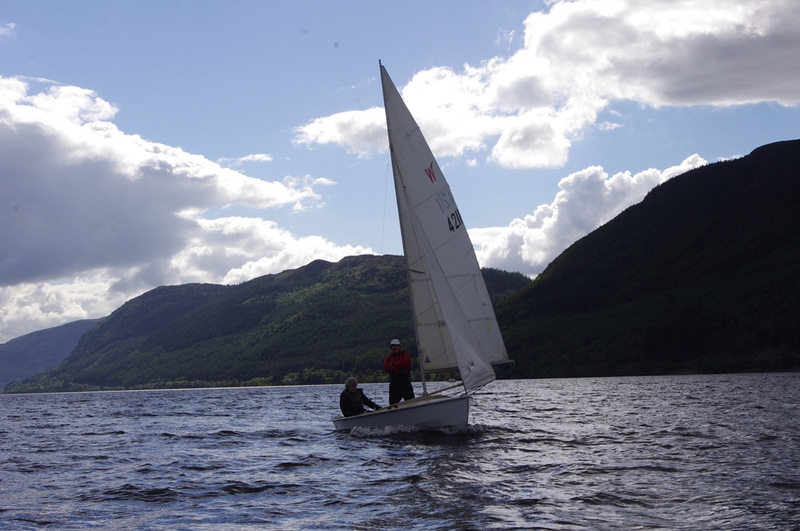 One Wayfarer was retired to its trailer, after bringing the boats through the 4 locks and swing bridge at Fort Augustus, with the remaining 2 Wayfarers setting out in the sun and a following breeze for a glorious afternoon sail up Loch Ness. 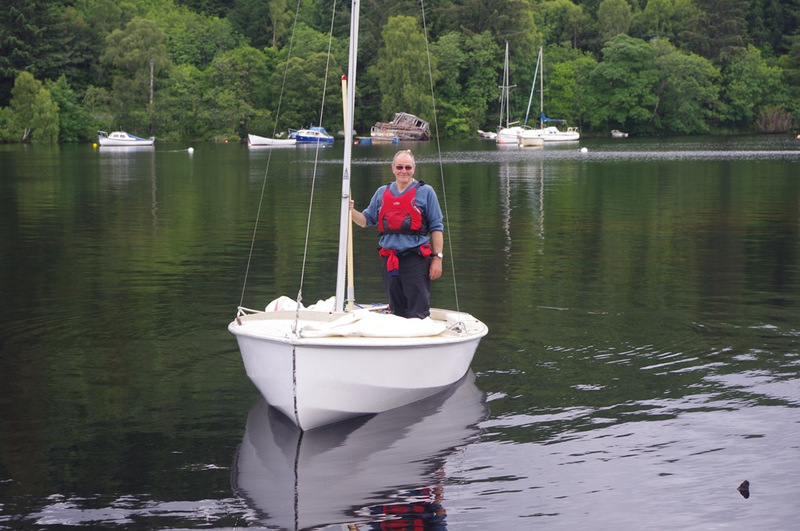 Worth noting that Dave Thompson won the inaugural Loch Ness Wayfarer 23 mile race with an impressive come-from-behind final sprint! 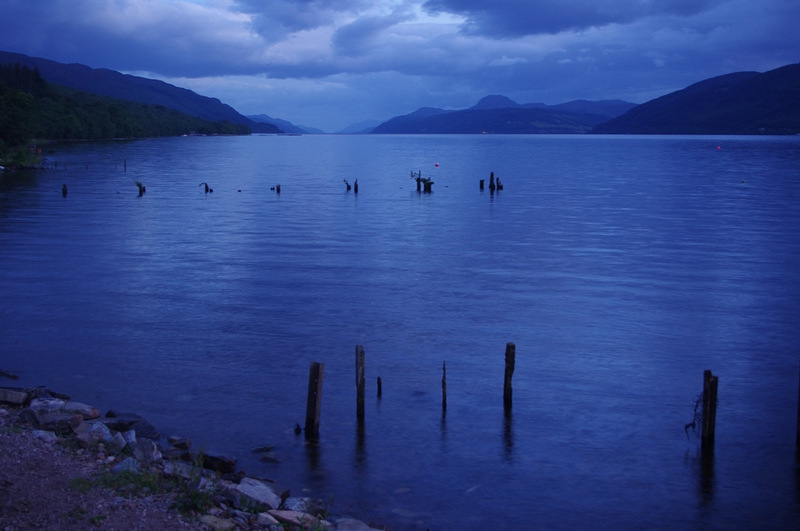 Landing elatedly on the shore west of Dores a wild camp was set up and a few fine ales enjoyed at the Dores Inn, though we sadly arrived too late for dinner. 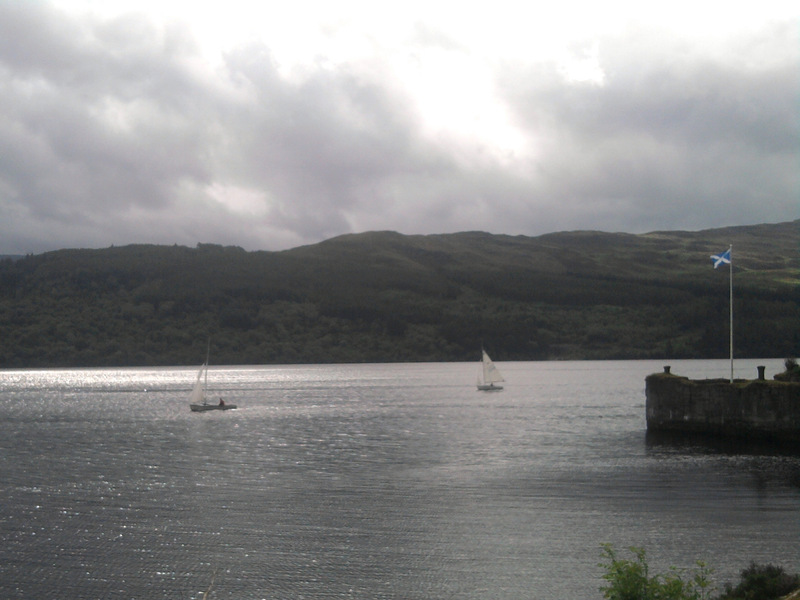 Up at 4am to the sound of boats bouncing off the beach (more lessons learnt!) 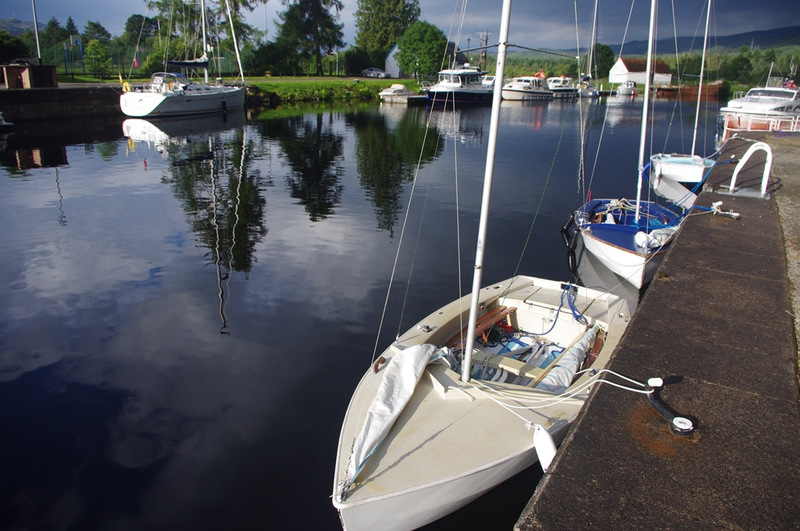 meant striking camp early and heading around the point up to Loch Dochfour and a rest stop for some coffee and breakfast in the sun at Dochgarroch lock. 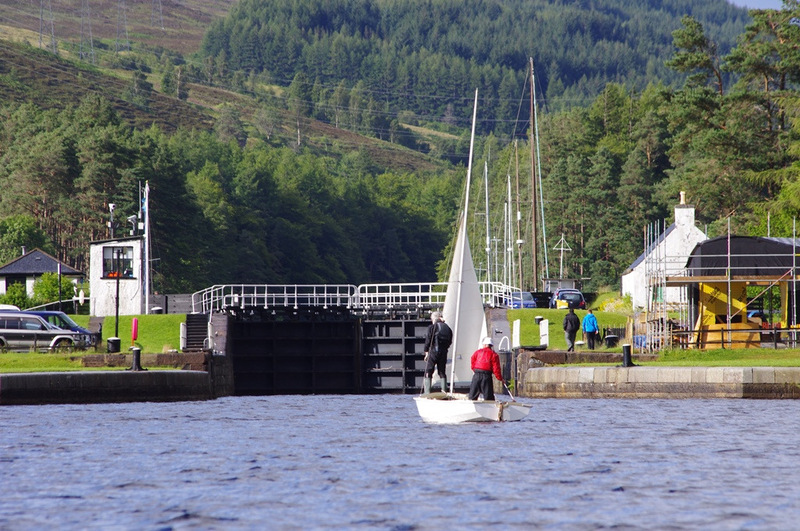 Then a final pleasant sail in a strengthening tailwind along the last 5 mile stretch of canal to the Tomnahurich swing bridge. 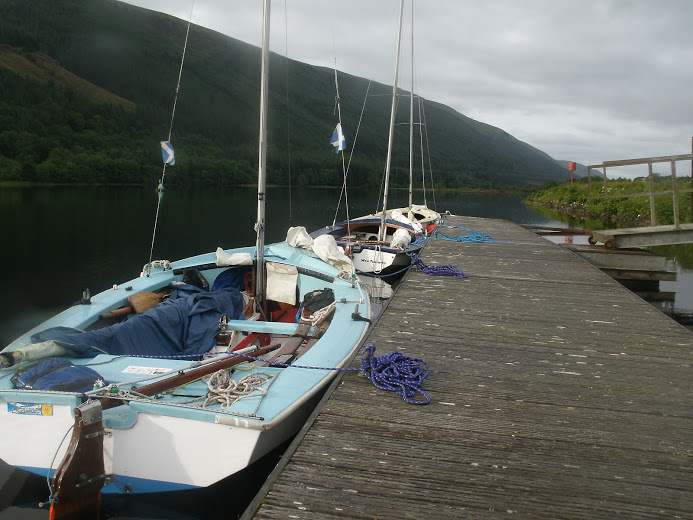 There we hauled the boats out, after a bus trip to Fort Augustus to retrieve cars and trailers and headed for home. 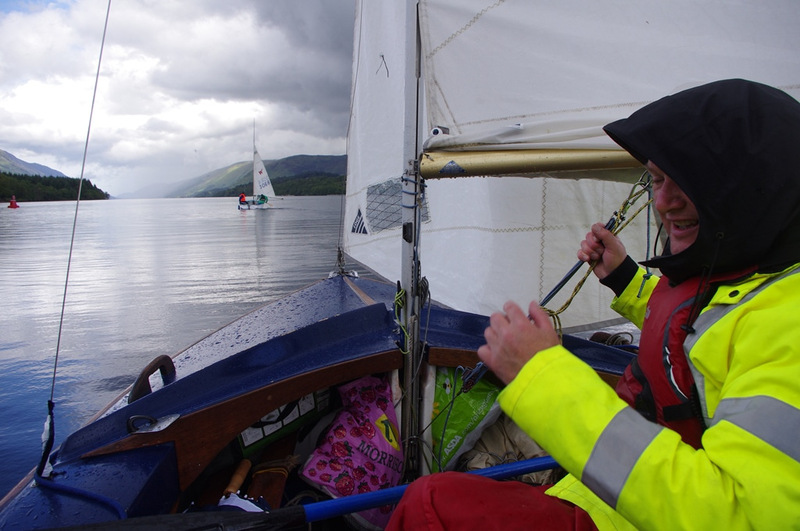 A successful and enjoyable experience, though tiring in the Scottish conditions!